Gnocchi are little dumplings made with potato flour. So even though they are potatoes, it's not like you are eating little chunks of potatoes. They are Italian, and are usually included in pasta categories, although technically they aren't pasta. I don't make gnocchi myself, but I like to buy it premade and make different sauces to go with it. Last weekend I went on a bus trip to Chicago with my mom and sister and we stopped at a Trader Joe's. Jim and I used to frequent Trader Joe's when we lived in St. Louis, but there aren't any in the Grand Rapids area. Anyway, I picked up some gnocchi there. You should be able to find it in any decent grocery store. 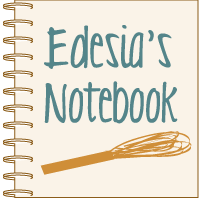 It may be in the refrigerated section with the prepackaged filled pastas. In a food processor, pulse together the first five ingredients. Stream in the olive oil. Remove from food processor and fold in the Parmesan. Makes enough for 1 pound of pasta. I think next time I make this, I might cut back on the oil just a tad. It makes pretty simple meal. I just boiled the gnocchi for a few minutes and drained them. Then I just tossed them with the pesto until it was evenly distributed. I served it with some chicken breasts that I seasoned very simply with salt and Herb de Provence and browned up in the skillet. Very simple, delicious meal. 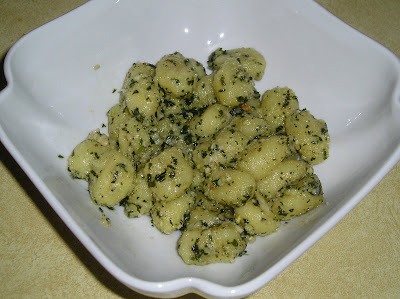 If you have yet to try gnocchi or pesto, I encourage you to do so.